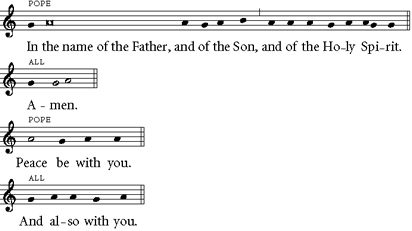 Papal Pilgrims singing from the same hymnsheet! "Thanks, Alistair, for all the work engraving music for the Handbook for the Papal Visit! It's been such a help … make helpful suggestions; do great quality work; respond generously to quite unreasonable deadlines and to do all this with such good humour!" When Pope Benedict XVI visits Scotland and England this week, pilgrims in each of the venues will be singing hymns and music that for the first time will appear in one booklet, drawing together the geographically separated events into one continuous celebration. It is all thanks to the skill of a small Scottish company, The Art of Music, based in Dunblane since 2006. Alistair Warwick, the MD of The Art of Music, explained that this music will "enable up to a million pilgrims to participate in song and in prayer during the various liturgies celebrated between 16th and 19th September 2010 in Glasgow, London and Birmingham". Alistair is well equipped to have been given this very prestigious task, given his past history in both music and music publishing. Formerly Director of Music at Arundel Cathedral, he has returned to his family’s Scottish roots by settling in Dunblane where he not only runs his music publishing and typesetting business, but also conducts the Stirling University Choir. He added, “A unique advantage of the Magnificat service book is that it will enable a million or so people to take part in the papal services at home – or wherever they may be. Even if they are not able to attend one of the events in person they will be able to access the music and feel that they can join in." 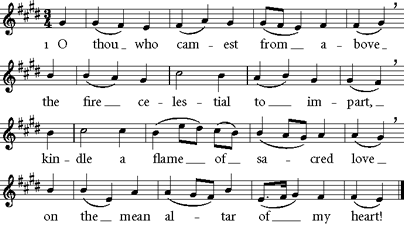 The music covers a range of styles reflecting the nature of those who will participate: from plainchant and polyphony to modern worship song. Each of the liturgies has its own distinct flavour: Glasgow includes Gaelic music and the Birmingham event features hymns by John Henry Newman, who is to be beatified on Sunday. A common feature, however, is a new setting by James Macmillan, the 'Mass in honour of Blessed John Henry Newman'. This mass setting complements his 'Mass of St Anne', which is sung in many churches throughout the British Isles and further afield. A particular challenge has been selecting the best way of notating the music, but it is one to which The Art of Music is well-suited, since Alistair has extensive knowledge and experience as a musician, especially in the field of church music. Alistair will not be taking a rest after the Papal Visit is over, as The Art of Music is currently typesetting the second edition of 'Hymns for Prayer and Praise' for Canterbury Press, which is designed to enable parish and religious communities to celebrate Morning, Evening and Night Prayer with song. Many people from different traditions find it helpful to set aside time for prayer at different parts of the day, and this hymn book provides a rich treasury of music and texts to help both individuals and communities. Follow our news on Twitter and Facebook.